Jim O'Brien and Michele Wales manage various aspects of running Coverdale Farm. Sheep are favorites of visitors. Young visitors look into the chicken coop. Children take part in craft stations offered at the farm during the May grand opening celebration. Native plants are for sale to visitors. One of the calves being raised at the farm. Visitors look at chickens in one of the large enclosures. After you drive up the long, curving driveway and park in the field, there's a sense of moving back in time as you approach Coverdale Farm Preserve. Aside from the visitors snapping photos of the animals with their cell phones, the farm looks much the same as it did in the 1800s. Sheep meander in the hillside pasture, accompanied by chickens pecking in the short grass. The stone barn dominates the hillside, just as it has since 1711. The 1711 barn overlooks the sloping pastures. For centuries, Coverdale Farm was a place to work, raise animals and tend crops. Today, it's a place that reconnects visitors with where their food comes from. 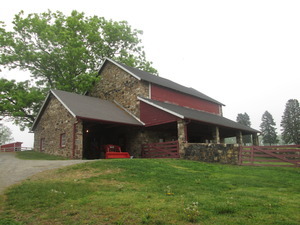 In early May, the Greenville farm opened to the public every Wednesday and Saturday for Farm Fun Days. Previously, the farm had been known only to those who signed up for an educational program or shared the farm's bounty through a Community Supported Agriculture (CSA) program. "The idea is to give people a casual, introductory experience, meet the folks that are here, and hopefully become a member of Delaware Nature Society," said farm manager Michele Wales. "Some people have never been to a farm before," said Dan O'Brien, the farm's CSA manager. "One of the main things we do is teach people where food comes from. So many times their minds are blown when we walk into the field and pull a carrot out of the ground, or pick a tomato off of a plant, and they get to eat it. So many of the students we see here have never experienced anything like this. And some of the adults, too. "This is an example of small-scale, sustainable agriculture," O'Brien continued. "This is not where most food comes from. A lot of the food we consume comes from massive farms that are incredibly efficient. This is more of a sustainable approach. We focus on being stewards of the land." 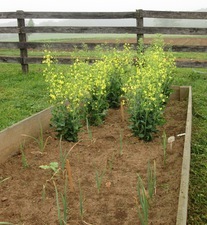 One of the farm's beds, where flowers are being grown. On a seven-acre plot, crops are grown without pesticides or genetic modification. The area is a living classroom for young students on field trips, as well as for students from the University of Delaware, who explore ways of managing insects and soils with hands-on experiments. The lessons learned can be translated to farmers around the world. "We don't use any herbicides," O'Brien said. "I must say that herbicides do wonders for modern agriculture on a large scale. We don't have to use them because we're small-scale." O'Brien got his MBA at the University of Delaware, and took classes in the ethics of food production, "which is eye opening to a lot of people," he said. In a world where food production is conducted on a massive scale, pesticides have become a requirement to keep yields high. The tomato that consumers in Pennsylvania pick up in February was grown far away, requiring transportation, which creates pollution. Workers are required to work for often low wages, keeping communities in poverty. "There's a lot of ethical issues that people don't want to think about when we're eating," O'Brien said. "We're so accustomed to getting whatever we want, whenever we want it. In January, you can get raspberries or tomatoes because they're grown in Mexico or Argentina. They've flown like 5,000 miles. So I tell people to buy seasonally, and buy local produce." At Coverdale Farm, crops are grown in ideal circumstances, and animals are living in luxury, as far as animal accommodations go. The pigs have large pens where they can roam around. Chickens have large, indoor-outdoor pens, and thanks to a chicken house mounted on a flatbed trailer, they can be taken to several different pastures and left to roam, doing what chickens do -- eat insects and produce fertilizer that enriches the soil. Chickens pecking near sheep are safer from predators, as well, O'Brien explained. And the better lifestyle and diverse food makes their eggs nutrient-rich, reflected in the dark orange color of the yolks. A sheep with triplets poses for a visitor's photo. "We have a rotational grazing program, where we move the animals through the field," O'Brien explained. "We bring the cows through the field, then the sheep through, then the chickens through. The cows eat the grass, the sheep eat everything the cows don't eat, and then the goats eat what's left, and the chickens go through and pick out all the insects, add nitrogen to the field for the grass, and then we can bring the cows back through." In many ways, the way Coverdale Farm is run is the way farmers traditionally cared for their land -- augmented with some more recent scientific discoveries. For instance, solar panels provide enough electricity for the whole farm. While the emphasis at the farm is on education, there is also plenty of history at the site. The land was originally part of a William Penn land holding of thousands of acres called Leticia's Manor, after one of Penn's daughters. The first farmer at the site was named Armstrong, an immigrant from Scotland. The stone bank barn has a 1711 date stone. The Armstrong family descendants operated the farm for decades before the Greenewalt family eventually took over in the 1930s. Some of the Greenewalts helped form the Delaware Nature Society, which today oversees Coverdale Farm, along with Ashland Nature Center, Abbott's Mill Nature Center, and the DuPont Environmental Education Center. "The Greenewalts had a multitude of crops, they raised beef cattle, they had pigs -- you name it. It was a diversified family farm," Wales said. "When they realized it was time for this farm to move out of the family, they looked at several organizations to take over, and they selected the Delaware Nature Society. Over the 1990s, small parcels were given over in sections. The final gift, which was in 1998, was the rest of the farm. "There were some beautiful views here, and we've preserved them," Wales said. "When we were given the farm, the goal was to make this a giant classroom. This is our 15th year in operation." Coverdale Farm is a field trip destination for between 12,000 and 14,000 students each year, but by opening on Wednesdays and Saturdays, and offering plants and produce for sale, more people can discover what the farm has to offer. "Because we live in a world where we don't all have to produce our own food, we've taken a step back from the land, and we've lost the value of food," Wales said. "It's available 24 hours a day. Sometimes when something's right in front of you all the time, you forget that it has a value. Whole foods come from the land. Of course, there are Frankenfoods that might happen in a lab. "But if you recognize enough to choose shopping here and eating food from here, and learning to cook with whole food -- that's an education," Wales said. "Now we're becoming more like a full-diet farm. We're not doing just vegetables. We'll be doing meat and eggs. My goal is for people to put Coverdale Farm on their grocery list. We want people to come down the road and know that the best eggs come from here, the best vegetables, the best chicken, the best Thanksgiving turkeys. It's a project that's going to take a long time. But what we're doing is doing farming in partnership with nature." Coverdale Farm is at 543 Way Road in Greenville, Del. It is open Wednesdays from noon to 2:30 p.m. and Saturdays from 9 a.m. to 4 p.m. from May through September. Admission is $5 for adults and $3 for children over 2. Children under 2 are free. Self-guided farm tours and a nature trail are open, there are activities for children, and visitors can arrive at 9 a.m. to help feed the animals. Special activities include: "Tractors, Trucks and Tools" (July 18); Celebrating National Honey Bee Day (Aug. 22); Bioblitz Celebration (Sept. 12). Visit www.delawarenaturesociety.org and click on the Coverdale Farm Preserve tab for more information.